Колокол Свободы находится в Филадельфии. The Liberty Bell is in Philadelphia. Ты видел, как он звонил в церковный колокол в воскресенье? Did you see him ring the church bell on Sunday? Иногда, когда вы слушаете внимательно, вы можете услышать колокол старой башни с часами из соседнего города. Sometimes, when you listen closely, you can hear the bell in the old clock tower in the nearby town. Митя любил слушать звон колоколов. Mitya loved to hear the chime of the bells. 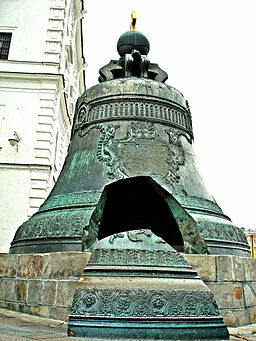 The Tsar Bell in Russia is the largest bell in the world. It weighs 201,924 kilograms (445,170 lb), and it is 6.14 meters (20.1 ft), tall. In comparison, the Liberty Bell in Philadelphia, Pennsylvania weighs only 900 kilograms (2,080 lb), and is only 1.5 meters (5 ft) tall. The Tsar bell could make any bell seem small in comparison though. It is made completely out of bronze, although it's hard to tell being that it's completely oxidized due to age. It has never been rung because it was broken during the metal casting. If it had been rung, it would have been extremely loud, and probably would have given anyone standing near it severe hearing loss. Unfortunately, it never got to be put in the clock tower, but it can be seen at the Kremlin in Moscow. It is decorated with beautiful relief images of angels, saints, Empress Anna, and Tsar Alexey. Волынка относится к числу наиболее древних музыкальных инструментов человечества. (source) The bagpipe is among mankind's most ancient musical instruments. — Твой брат всегда был глухим? У бабушки на даче раньше были тараканы, но как только она начала играть на волынке, так называемая музыка их выгнала всех. Grandma's summer house use to have cockroaches, but as soon as she started playing the bagpipe, the so-called music drove them all away. Last Saturday I was at a concert starring the famous Bulgarian musician Theodosii Spassov, and to my great surprise right in the middle of his band was a guy playing the bagpipe. Who knew the Bulgarians had bagpipes? And about an eighth of the time he played the bagpipe while standing on one leg, drawing the other up either to practice yoga or support the bag. If you have any idea why a piper stands on one leg while piping, please let me know in the comment section. It turns out that the Turks also have bagpipes, which they call tulum. The Czechs have bagpipes. The Spanish and Galicians have bagpipes. The Hungarians have bagpipes. The Italians have bagpipes. Even the Poles have bagpipes! What's even odder is that the Poles have nearly half a dozen words for the instrument, depending just where you are in Poland. The Russian word for accordion is гармошка. The accordion is a very popular instrument in traditional Russian culture and is often played at large gatherings such as a wedding свадьба, birthdays день рождения, and many holidays праздники. My uncle was one of the best accordion players I have ever known. Each time he played the instrument, everyone gathered around him and listened to the beautiful music. I always told my uncle that he played the accordion like a professional and that he would be able to make a very good living by doing so. «Дядя, ты очень хорошо играешь на гармошке. Ты можешь заработать много денег!» “Uncle, you play the accordion very well. You can earn a lot of money!”. During parties, everyone danced and sang as my uncle played the accordion! I remember one time when a few individuals at a party had too much to drink. They danced happily and suddenly, I saw them lose their balance and fall to the ground laughing like hyenas. My mom laughed and said to them «Я думаю что вам пора домой!» “I think it is time for you to go home.” I enjoyed hearing my uncle play the accordion and every time I hear someone play this beautiful instrument, I am reminded of my uncle’s great talent.